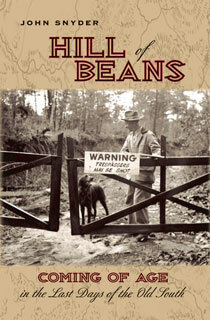 This memoir of growing up in the Old South during the Depression evokes a time gone by. And while it is a loving memoir, it is populated by real people dealing with hard times, sometimes with cruelty, sometimes with violence–including a mysterious case of arson that forever changed John Snyder’s life. “This is great stuff, extremely well remembered. There can’t be many memories left of this time and place, and these are richly told.”… Roy Blount, Jr. humorist and author of 22 books including Crackers, Be Sweet and Alphabet Juice. “John Snyder has conjured up a vanished world. The hardscrabble South he depicts in this beautifully evocative memoir calls to mind Faulkner and Flannery O’Connor. It’s a work of inspired anthropology, rich in folklore, and a work of literature.”—James Atlas, author of Bellow: A Biography and a memoir My Life in the Middle Ages. John Snyder grew up in North and South Carolina, attended the University of Chicago and moved to New York in 1959. He worked as a buyer for Bloomingdale’s, in carpet manufacturing, and finally in finance, retiring as an executive director after 13 years at Morgan Stanley. Along the way, he was awarded seven patents, made an industrial film that won first place in the NY Film Festival, and wrote 2 off-Broadway plays. Throughout his working career, he maintained a machine shop for making prototypes of inventions and turning found objects into sculpture. In retirement he continues to make sculpture (www.johnsnyder.org), and has written this memoir, the first of three parts. He and his wife divide their time between New York City and Cedar Mountain, North Carolina.